I was expecting to report on a score where I had to spell it out in letters for emphasis. Alas, it was just a single Jill Scott header that won it for England. But they end the year with a win. And what a year it's been for the women's game. BBC Sport's Alistair Magowan braved the wind and driving rain at Ashton Gate to bring you a comprehensive report from England's win. England get a smiley face from winger Karen Carney. After waiting four months for England to come home, we've now got to wait another five months before they're back in action again. Mark Sampson's side host group leaders Belgium up next on Friday, 8 April 2016. Former England international Kelly Smith: "What a year it's been for England women. They've had recognition all over the world as well as at home. Players are now household names. "This wasn't the performance we wanted but I'm sure they'll go onto top the group." Ex-England keeper Rachel Brown Finnis: "This has been about making history. Women's football is on the map and I can't wait to see England go out there and get Euro silverware." Former England goalkeeper Rachel Brown-Finnis on BBC 2: "It's disappointing that we didn't get the raft of goals we expected. "But it's the end of a successful season and it's been a long hard season and today they just ground it out." It wasn't quite the homecoming goal-fest we were predicting but it's two wins from two in group seven for England. Bosnia make another change in the first of three minutes of injury time. Forward Alisa Spahic saunters off and is replaced by Zerina Piskic, who immediately makes a nuisance of herself on the right flank. The band are rocking in the stands of Ashton Gate, but it's all gone a bit flat on the pitch. It's wet and heavy out there and everyone looks knackered because of it. England see Demi Stokes bomb up the left channel and Jemma Rose takes a shot from distance which goes wildly over. Quote Message: I’ll go for Gemma Davison as my player of the match for her first-half performance. She was lively and creative. She wanted to make things happen. I’ll go for Gemma Davison as my player of the match for her first-half performance. She was lively and creative. She wanted to make things happen. Quote Message: There’s no doubt that [England winning] will be the case . It’s just trying to get another goal for the fans. There’s no doubt that [England winning] will be the case . It’s just trying to get another goal for the fans. Captain Steph Houghton jogs off and is replaced by defender Jemma Rose, who's familiar in these parts. Before joining Arsenal Ladies, she spent five years at Bristol Academy and worked under Mark Sampson at the Vixens. Quote Message: Scotland hit double figures for the first time in Anna Signeul's reign today. 10-0 doesn't even flatter their dominance. Seventeen unanswered goals in two home Euro qualifiers. Scotland hit double figures for the first time in Anna Signeul's reign today. 10-0 doesn't even flatter their dominance. Seventeen unanswered goals in two home Euro qualifiers. Quote Message: It was worth a go. When you’re in acres of space, why not have a go? It was worth a go. When you’re in acres of space, why not have a go? England's Laura Bassett finds acres of space and has a go from 25 yards but it's wide of the target. Meanwhile, Nikolina Dijakovic, who was lucky not to be sent off earlier, is replaced by Amna Lihovic for Bosnia. Just had word that there's 13,040 at Ashton Gate this afternoon. Your team-mate has spoken, England. Anon on text (81111): As a football fan I think the women's team show how football should be played. Fairly, enthusiastically, and in the spirit of sport as a game not making a living. Jordan Nobbs has been a stand-out player for England today. The Arsenal Ladies midfielder has so much energy and paces forward before trying a looping shot from distance which goes over. Will the floodgates open now for the hosts? England have been put to the test by a very well organised and defensively solid Bosnia side. But maybe all that defending has tired them out? Less than 20 minutes to go in Bristol. Quote Message: All Bosnia’s players have gone back to their own half. Once you lose heavily a couple of times you learn that you can’t keep playing your own way away from home against teams ranked better than you. All Bosnia’s players have gone back to their own half. Once you lose heavily a couple of times you learn that you can’t keep playing your own way away from home against teams ranked better than you. Yellow card for Amy Turner and she's been pretty lucky there. She went in, studs raised, onto midfielder Aida Hadzic. The England full-back looks a bit sheepish as she walks away. "A little girl in front of me just shouted 'Will we ever see a goal?' A minute later Jill Scott obliges. Such is the selflessness of the Manchester City midfielder." Quote Message: I’m so pleased for Jill Scott. Good work by Eni Aluko to beat her player down the left and put in a cross. It’s a good directed header from Jill. The goalkeeper could have done better, she’d been excellent all night. I’m so pleased for Jill Scott. Good work by Eni Aluko to beat her player down the left and put in a cross. It’s a good directed header from Jill. The goalkeeper could have done better, she’d been excellent all night. At last! A breakthrough for England. Eni Aluko leaves the comfort of the penalty box and twists and turns before delivering a ball to Jill Scott. The 5ft 11in midfielder gets her head under it and it swerves past the keeper. Relief from the partisan crowd. England midfielder Jordan Nobbs has a crack from distance. It's a powerful strike and the wind makes it swerve towards goalkeeper Almina Hodzic, who frantically punches it away.She's kept Bosnia in the game today. WB on text (81111): Pretty poor advert for the women's game, this. Quote Message: It was a definite push in the back. I don't even think she went for the ball. It should be a penalty. It was a definite push in the back. I don't even think she went for the ball. It should be a penalty. Eni Aluko with another near miss and you can sense England's frustration. A beautiful ball in from Steph Houghton but striker Aluko scuffs her effort. England have another go and it looks like defender Houghton is pushed down in the box, but no penalty given. "Teeming down with rain now and the crowd are getting restless with Bosnia-Herzegovina's attempts to kick the ball upfield and defend their own penalty box. The home fans and the England team are desperate for a goal." Quote Message: Toni Duggan has gone out to the left to give the team a bit more balance. Toni Duggan has gone out to the left to give the team a bit more balance. Had a quick glance at the stats and it's 71% possession for England so far, but they've yet to get that elusive goal. Scotland can definitely afford to lend one to this game (see below). England's Izzy Christiansen is replaced by forward Toni Duggan, who gets a brilliant reception from the crowd. She was one of the poster girls from the Women's World Cup this summer. Can she work her magic here? Quote Message: That’s a yellow card offence – she should have gone. She’s a lucky girl. When she went down she was stretching her calves, maybe to avoid being booked. That’s a yellow card offence – she should have gone. She’s a lucky girl. When she went down she was stretching her calves, maybe to avoid being booked. A nasty challenge from Nikolina Dijakoivc, who's just been booked, on Izzy Christiansen and there's calls for a red card. Meanwhile, there's been a substitution for England as Jill Scott is on for Jess Clarke in midfield. England defender Alex Greenwood, who didn't make today's match-day squad, has been talking to BBC Two. "We should keep the ball coming into the box, we’re causing them a lot of problems doing that. We should remain positive. The goals will come." Really difficult conditions at Ashton Gate now. It's teeming it down. Bosnia full-back Nikolina Dijakovic gets a yellow card for a challenge on Laura Bassett and from the resulting free-kick Jordan Nobbs hits a blistering shot at the keeper. Better from England. Steph Houghton knocks the ball into the net for England but the referee had blown for offside before Eni Aluko's ball-in. A few of the crowd missed the whistle and flag, though, and give it a little cheer anyway. After a huddle from each team, we're back underway in the driving rain in Bristol. The band have started with a rendition of God Save The Queen. England ended 2014 and started 2015 with defeats by Germany and USA. But 2015 has been pretty good. Can they make it 13 wins from 19 games? Second half at Ashton Gate coming up now. Quote Message: It’s a frustrating afternoon. England need to remain patient and move the ball a bit quicker. Once they get a goal hopefully the floodgates will open. It’s a frustrating afternoon. England need to remain patient and move the ball a bit quicker. Once they get a goal hopefully the floodgates will open. 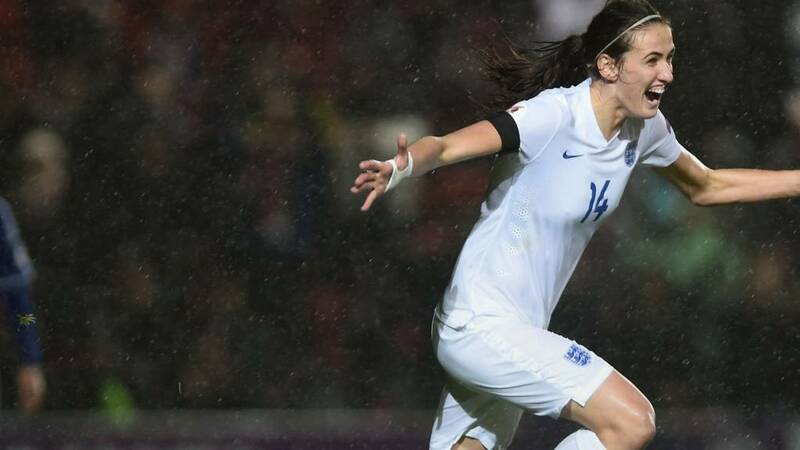 England winger Karen Carney was one of six 100-cap players honoured by Uefa before kick-off. Still 30 minutes to go in Paisley. We're definitely going to see double figures. Maybe they can lend us some goal drama for the England game. Quote Message: I’ve played in many games that involved being patient. The movement is the key. I’m sure in the second half as Bosnia tire there will be more space. I’ve played in many games that involved being patient. The movement is the key. I’m sure in the second half as Bosnia tire there will be more space. Everyone thought they'd be plenty of goals in this one. How wrong we were. A frustrating first-half for England. Do England need to make a change? "England are getting into the penalty box plenty, but you wonder whether substitutes Ellen White or Toni Duggan might give them more presence to get on the end of all these crosses. More composure in front of goal is definitely needed." Quote Message: It’s so difficult for Bosnia when you’re just defending and chasing the ball without possession. It’s mentally and physically draining. It’s so difficult for Bosnia when you’re just defending and chasing the ball without possession. It’s mentally and physically draining. You have to wonder how long Bosnia can defend for. It's threat after threat from England but they just can't get it in the net. Jess Clarke, this time, gets the ball to her feet inside the six-yard box but can only scuff it, and eventually it's cleared. Good old Bristol rain now pouring down at Ashton Gate, just to add to the near gale force winds. Lovely. Quote Message: I’m getting frustrated myself just watching. England are trying but if it’s not working then try to get it out to Demi Stokes on the left. I’m getting frustrated myself just watching. England are trying but if it’s not working then try to get it out to Demi Stokes on the left. Quote Message: It was much better from England, one and two-touch passes. I think they’re trying to switch players as quickly as they can. Some of the England players are getting frustrated - they can't get forward and they're not used to it. It was much better from England, one and two-touch passes. I think they’re trying to switch players as quickly as they can. Some of the England players are getting frustrated - they can't get forward and they're not used to it. Steph Houghton tries something a little different. The England defender takes a punt from distance but it comes to nothing. The Lionesses start from the back again and Demi Stokes races up the left wing but the ball in is blocked by Bosnia's brickwall of a defence. I don't need to read Mark Sampson's sign language any more. You can hear him shouting loud and clear: "Jordan, keep your discipline." Listen to the gaffer, Ms Nobbs. Superb first half from Scotland and in particular left-back Hayley Lauder. She's crossed in for four first-half goals and got herself on the scoresheet. Scotland lead 6-0 and will certainly continue their 100% start to their qualifying campaign. Watch the game and listen to live commentary here. The players grab a drink while Bosnia keeper Almina Hodzic receives treatment after clashing heads with her own defender. The England women gather for a quick tactical discussion. They'll no doubt be frustrated with their missed chances so far. Another whipped ball in, but another miss from England. Defender Steph Houghton heads towards Eni Aluko and the striker nods it high and just over the bar. Quote Message: England players seem to have a little meeting before each corner. It might be a tactic. But I think it’s actually slowing play down and giving Bosnia a breather when you don’t want them to. England players seem to have a little meeting before each corner. It might be a tactic. But I think it’s actually slowing play down and giving Bosnia a breather when you don’t want them to. A rare attacking run from Bosnia forward Lidija Kulis sees England goalkeeper Karen Bardsley finally touch the ball. She must be freezing up there with not much to do. Mark Sampson is gesturing to his players from the Ashton Gate sidelines. I'm no sign language expert, but it looks like he's saying get wide and/or forward. Quote Message: Good play by England, Jordan Nobbs whips the ball in and Eni Aluko – good run but should have done better with the finish. That’s what you want from your striker, that instinct, but then it’s just the finish at the end. Good play by England, Jordan Nobbs whips the ball in and Eni Aluko – good run but should have done better with the finish. That’s what you want from your striker, that instinct, but then it’s just the finish at the end. Close for England, and Jordan Nobbs is involved again. The Lionesses' midfielder hooks the ball in across the area and striker Eni Aluko tries to slide it home, but it goes just wide. Quote Message: We saw in the World Cup Mark Sampson’s know-how at set-pieces but they haven't’ shown it here so far. They’re just putting it in long but Bosnia have everybody back. When I was playing in games like this everyone would condense so much because they wanted the ball. We saw in the World Cup Mark Sampson’s know-how at set-pieces but they haven't’ shown it here so far. They’re just putting it in long but Bosnia have everybody back. When I was playing in games like this everyone would condense so much because they wanted the ball. Bosnia have 10 players behind the ball and are proving to be a bit of a brick wall for England so far. Midfielder Izzy Christiansen whips in a wind-assisted corner but Almina Hodzic gathers well. The Bosnia keeper has been impressive so far. "Lively start by England and the fans are lapping up every step over and trick that the hosts are trying, Gemma Davison especially. No point in hitting it long, it'll just run out of play via the gale that is blowing England's way." Quote Message: England need to make sure they stay patient and calm and keep sticking to Mark Sampson’s gameplan. England need to make sure they stay patient and calm and keep sticking to Mark Sampson’s gameplan. Midfielder Jess Clarke has a crack as well, with a curling effort from the outside of her boot, but it's saved. England are firmly in control so far. Quote Message: I’ve got no idea how that didn’t go in. But what a strike from Jordan Nobbs. I think the keeper just tipped it onto the bar. That’s a really good save. I’ve got no idea how that didn’t go in. But what a strike from Jordan Nobbs. I think the keeper just tipped it onto the bar. That’s a really good save. Jordan Nobbs hits a sweet, sweet lob and it goes crashing onto the cross bar as goalkeeper Almina Hodzic gets the slightest touch, and the danger is eventually cleared. Quote Message: Casey Stoney is such an experienced player. Technically she's so good on the ball. I’m so pleased for her that she’s starting. She deserves it. Bosnia are still a step behind England - they've come here to defend and try to limit the amount of goals England score. Casey Stoney is such an experienced player. Technically she's so good on the ball. I’m so pleased for her that she’s starting. She deserves it. Bosnia are still a step behind England - they've come here to defend and try to limit the amount of goals England score. Eni Aluko is making a menace of herself in the Bosnia box. The England forward tries to latch onto the end of Izzy Christiansen's corner and when it's recycled from the other side of the penalty area, Aluko tries again to flick it past the keeper. You suspect it's game over in in Paisley. Jenny Beattie and Hayley Lauder have put Scotland out of sight within half an hour. BBC Scotland's Eilidh Barbour: "Very disciplined opening half hour from Scotland to take a 4-0 lead. Moving the ball too quickly for their opponents." The hosts are knocking the ball about well, trying to play from the back, but it gets a bit scrappy and crowded when England go on the attack. Bosnia are expected to play very deep today, and be very physical. A corner is whipped in and captain Casey Stoney is clattered. Let's get the homecoming party started. England kick-off, shooting left to right towards Ashton Gate's East End. Ex-England international Kelly Smith on BBC Two: "After the World Cup, England probably looked to see when their first home game was and really get their home fans on board." Former England keeper Rachel Brown-Finnis: "The crowd will be expecting goals which is fantastic. England are now expecting to win Euro 2017." Special presentations underway as England's Casey Stoney, Fara Williams and Jill Scott receive awards for reaching over 100 caps each for their country. The national anthems kick in, and we're nearly ready for the off. The captains lead out the teams into what looks like bloomin' freezing day in the West Country. There's some kids in the crowd with blankets wrapped around them. Good planning by sensible parents. So far they are fair to middling in group seven for Euro 2017. They have already played four times - winning two and losing two - and are level on points at the top of the group with Belgium. However, the Belgiums have put 11 goals past them in during qualifying. Ouch. The England players have shared their excitement for today's game in Bristol on Twitter. And they've even managed to squeeze in a little plug for BBC Two's coverage which is on now. Thanks, ladies. "If you want hard evidence of how the Lionesses inspired youngsters during the World Cup, then the bowels of Ashton Gate is a good place to start. Absolutely teeming with kids playing football, smacking reaction-test boards and even waving flags like an enthusiastic referee's assistant." Jo Love has just headed Scotland into a 2-0 lead in their qualifier against Macedonia. BBC 2 NOW for live coverage of the Euro 2017 qualifier from Ashton Gate. The lovely Tina Daheley is there to welcome you. You can also listen to BBC radio commentary by clicking the coverage tab at the top of this page. The nine England players who have reached 100 caps will be honoured before today's game at Ashton Gate. The group, which includes current squad members Casey Stoney, Fara Williams and Jill Scott, will receive a special cap from Uefa. Fara Williams (147 caps), Rachel Yankey (129), Alex Scott (129), Casey Stoney (123), Gill Coultard (119), Kelly Smith (117), Karen Carney (110), Rachel Unitt (102), Jill Scott (100). Yes, yes, I know England manager Mark Sampson is actually Welsh, but today's match in Bristol is a bit of a homecoming for him, too. Sampson managed Women's Super League side Bristol Academy for four years, and his success on a shoestring earned him the England gig in 2013. Welcome back, Mark. Or as they say in Bristol: "Have a gert lush time." "Mark Sampson keeps his title as the 'tinkerman' after making seven changes. "The England boss has named three centre-backs in his side - captain Steph Houghton, Laura Bassett and Casey Stoney, with Bassett likely to play in midfield. Notts County's Amy Turner will start at right-back while Gemma Davison, Jess Clarke and Eni Aluko all coming into an attacking line-up. "Bosnia-Herzegovina striker Milena Nikolic is their top scorer in Euro 2017 qualifying with a hat-trick against Estonia. Fellow forward Lidija Kulis plays for German side Turbine Potsdam and is also one to watch out for." I have just spoken to Scotland coach Anna Signeul before today's game. Kim Little and Jenny Beattie have flown back from Melbourne City and Signeul said: "They were a little tired but they've looked very sharp in training." On the terrible weather: "I'm surprised the pitch is in such good condition. I'm sure we can still put on a very good performance." On expectation and pressures: "It does add pressure but this squad have developed and are confident. We're not cocky and we respect every team we play against but we know we can play well. We're excited for the opportunity and playing games that really matter." Scotland: Fay, Dieke, Love, Lauder, Little, Weir, Evans, J Ross, Corsie, Beattie, Brown. Subs: Lynn, L Ross, Crichton, Arnot, Clelland, Smith, Arthur. Macedonia: Doneva, Naumoff, S Andonova, M Arsova, Angelovska, Andreevska, Rochi, Jakovska, N Andonova, Bojku, Chubrinovska. Subs: Kostova, D Kostova, Pejkova, Mileska, Markovska, Saliihi, Ristovska. Watch and listen to that game here. Scotland and Northern Ireland are also vying for a place at Euro 2017. The Scots are currently second in group one and face Macedonia in Paisley today at 15:05 GMT. We'll bring you updates of their progress right here - you can watch and listen to that game on the BBC Sport website. Northern Ireland haven't found themselves in such a fortunate position. Their 8-1 drubbing against Switzerland on Friday leaves them fourth in group six. Highlights of the game can be found on this link. England's World Cup campaign came to an exciting end when they beat Germany 1-0 with a late penalty to take the bronze medal. The two teams met again on Thursday, and the Lionesses played out a 0-0 draw with the European champions in Duisburg. Fancy catching the highlights of the game? Click here. Glenn Foster: I'm really not sure what Jill Scott adds to the team. Sure she is awkward to play against, but she offers little else. Manager Mark Sampson makes seven changes from the 0-0 friendly against Germany on Thursday. Lucy Bronze, Gilly Flaherty, Jodie Taylor, Alex Greenwood are left out, while Fran Kirby, Fara Williams and Jill Scott are dropped to the bench. England: Bardsley, Turner, Houghton, Stoney, Stokes, Bassett, Nobbs, Clarke, Christiansen, Davison, Aluko. Subs: Rose, Telford, Scott, White, Kirby, Duggan, Williams. Bosnia: Hodzic, Amira Spahic, Dijakovic, Seslija, Radeljic, Alisa Spahic, Hadzic, Melisa Hasanbegovic, Aleksic, Kulis, Nikolic. Subs: Envera Hasanbegovic, Crnjak, Numanovic, Lihovic, Piskic, Stanic, Kameric. England are favourites to top group seven and head to the Netherlands for Euro 2017. The Lionesses started their qualifying campaign with an emphatic 8-0 victory over Estonia. Next up are Bosnia-Herzegovina, who sit 74 places below fifth-place England in the rankings. We've got it covered for you today. You can watch the game live on BBC 2 from 15:30 GMT. We'll have live text commentary right here on BBC Sport and you'll hear updates from Ashton Gate on BBC Radio 5 live throughout the afternoon. Yeah, so, it feels like we're a bit late to the party with the ol' World Cup homecoming. But England women haven't taken the last four months off to get over the hangover. A couple of friendlies, a tournament in China, and now their focus moves to qualification for Euro 2017. In the summer of 2015, 23 Lionesses headed west in trepidation for the Women's World Cup in Canada. After highs, lows, tears and extra-time penalties, the England team returned national heroines with a bronze medal in tow. Now, 148 days later, it's time for their homecoming match.